The US tied a very evenly matched Sweden in a game that was more interesting than exciting. The two most memorable moments of the match will leave Sweden feeling they were deserving of a win, but for the second game in a row the United States were significantly better as the game wore on. If they can solve their midfield possession and scoring difficulties, the US could be well poised to compete against other top teams. Then, at 77′, Seger flicked a shot with the outside of her boot that had beaten Hope Solo and was destined for the top right corner of the net when Meghan Klingenberg headed it onto the post and out to produce the other critical moment of the game. Sweden will again feel that luck was on the US side, but at least here one must credit Klingenberg’s positioning and play. Moreover, this was the culminating moment in what was an all-around excellent game for both Klingenberg and, indeed, for the US defense as a whole. These two moments aside, though, the game offered more tactical interest than raw excitement. Describing a game as a chess match is surely a mixed blessing, but there was definitely an element of strategery (to use an appropriately American term) in Pia Sundhage’s approach to playing her former side. To begin with, she chose to play Lina Nilsson, a left back by trade, up on the left wing. While it’s possible that Sundhage was merely responding to the way in which Nigeria’s Asisat Oshoala had owned that flank in Sweden’s previous game, it seems likely that Nilsson was brought in specifically to handle either Christen Press, who nominally played on that flank in the previous game, or in anticipation of the introduction of Brian Morgan. In either case, Sundhage seemed comfortable with Therese Sjögran and Elin Rubensson handling Megan Rapinoe on the opposite. Sweden opened the game in a 4-4-2, with Sjögran playing wide on defense but tucking inside to help her team gain a numerical advantage in midfield. Inside, Lisa Dahlqvist usually marked Lloyd, while Seger tended to drop off and provide additional support against Press. As the United States continued to attack primarily down the right, however, Sjögran moved permanently into the middle. By 15′, Linda Jacobsson shifted to the right and Sweden were in a 4-2-3-1 for the majority of the half. It’s difficult to work out the cause and effect between Sweden’s shift and their dominance in midfield. What is certain is that, for the second game in a row, Lauren Holiday and Lloyd seemed totally incapable of imposing themselves on the game. By 20′, the US midfield was forced back to the point that Dahlqvist was often pushing forward to create more of a 4-3-3 in attack, at least initially drawn into that advance role by Lloyd’s retreating position. The United States looked static and predictable when they did get the ball. Press was, at least, willing to strike when she got the chance, but this was inevitably from static positions rather than moving into space, which allowed Sweden to block her attempts relatively easily. Sweden were clearly the better side and had 59% first half possession. Though I don’t have the data to confirm it, most of that possession must have come in the opening 35′, as the US finally began to assert some influence in the final 10′ of the half. In this game, the change was not merely a matter of fitness, as Ali Krieger began to redirect the US attack down the left flank to Rapinoe. Sweden recognized the difference, and by 40′ they had returned to their starting 4-4-2 in order to better protect that flank. Krieger was by far the most influential player for the States, though this may speak as much to Lloyd and Holiday’s absence in midfield. Sweden had struggled with fitness in their opener against Nigeria, and the United States were the dominant team in the second half, where they had 62% of possession. At 50′, Sweden returned Sjögran to a central position, but after a few good chances Sweden was effectively driven into a defensive 4-4-1-1 trying to hold off the US. 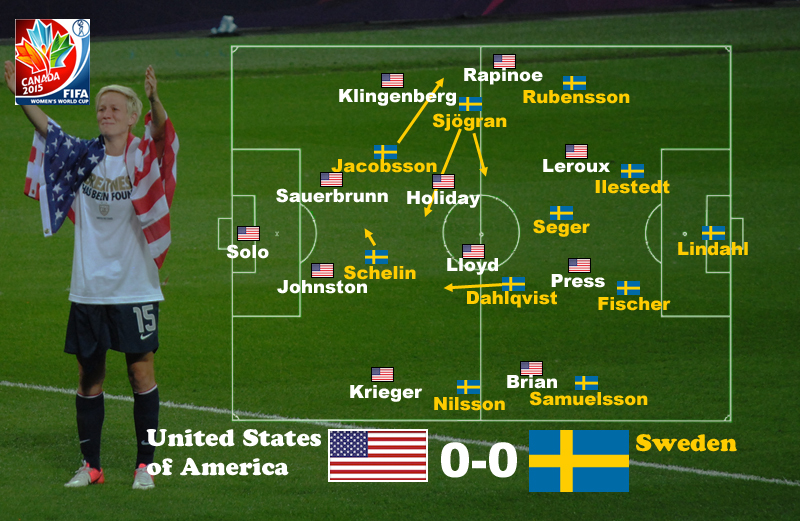 The rest of the game featured the United States bringing in different personnel in hopes of unlocking Sweden’s defense. Amy Rodríguez freed Press up to play underneath two strikers (nominally, she had moved out right). Then Abby Wambach replaced Press, playing first alongside Leroux and then Rodríguez, with the other striker shifting to right wing. Finally, Alex Morgan replaced Leroux and joined Wambach up top. Rapinoe whipped in crosses, and Wambach had a good chance at 72′. But Lloyd was the most effective ariel threat late in the game. She had a number of good chances, including the one where she opened up Jessica Samuelsson’s head. Though in many ways Lloyd was the worst player on the pitch, she was probably the most consistent threat for the United States late in the game. That creates a genuine selection problem going forward. On the plus side, the US defense was first rate across the board, stifling a quality Sweden side. Julie Johnston is looking quite respectable alongside Becky Sauerbrunn, while Klingenberg and Krieger were each in their own way stand-out performers. Keeping Sweden off the scoreboard in the first half was a significant achievement, and suggests that at least one end of the pitch is relatively well sorted. Everyone is an expert at solving a manger’s problems. Having said that, Jeff Carlise, writing for espnW, has some solid suggestions, especially given the realistic possibilities with manager Jill Ellis’s relatively conservative approach. Getting Tobin Heath in on the right should probably be at the top of that list. This tie means that only a win against Nigeria will ensure the United States top spot in the group. That’s important, as the group runner-up will face Brazil in the round of 16. Nigeria is a much better team than their ranking suggests, and should give the US an uncomfortable 90 minutes.